On Friday, I felt a quieter day was in order. And that turned out to be the perfect excuse to pack up my laptop and head to Brixton to explore a new area. Brixton has a reputation as being an "up-and-coming" sort of a place. A bit trendy, a bit indie, that sort of thing. And I liked it very much. While I didn't take many picutres of the place itself (parades of shops etc. just weren't working for me) I did visit a couple of great places that I snapped eagerly! The first was the much-lauded cinema, the Ritzy. 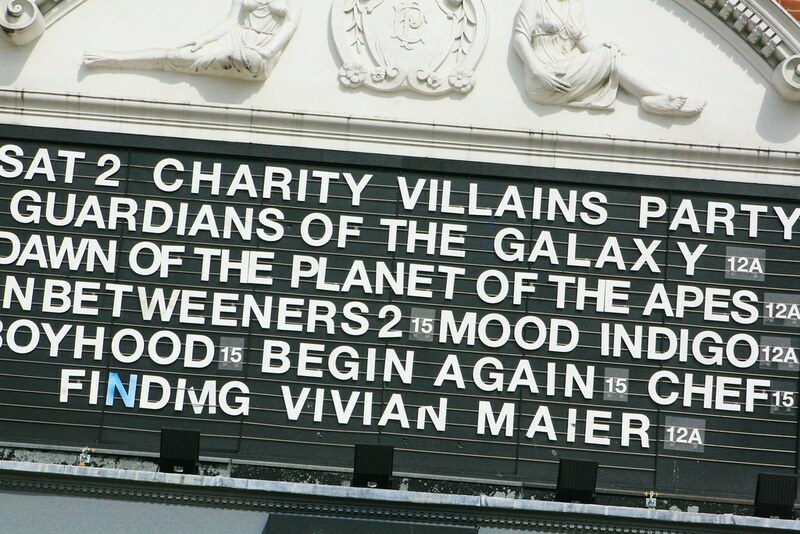 I'd heard of this cinema before and determined to go, and I was not disappointed. 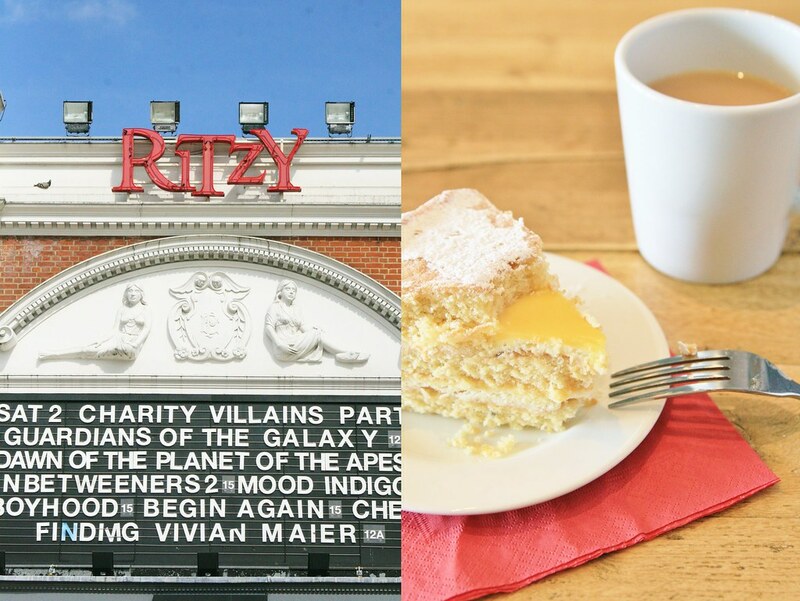 The Ritzy has a couple of a lovely cafes, and as it's an independent cinema (under the Picturehouse umbrella), it had a lovely feel quite unlike the soulless multiplexes. I loved their film board up outside the cinema, and the cafe had the most amazing triple-layer lemon curd and lavendar cake. The lady who served me pointed out that it was a very large slice, but that she thought at £3 a pop, customers ought to get a large slice. However, she also found that not all customers ate a whole slice when they were large. I promised her that I would eat it all, and I had no difficulty whatsoever in keeping my word. Nom nom! 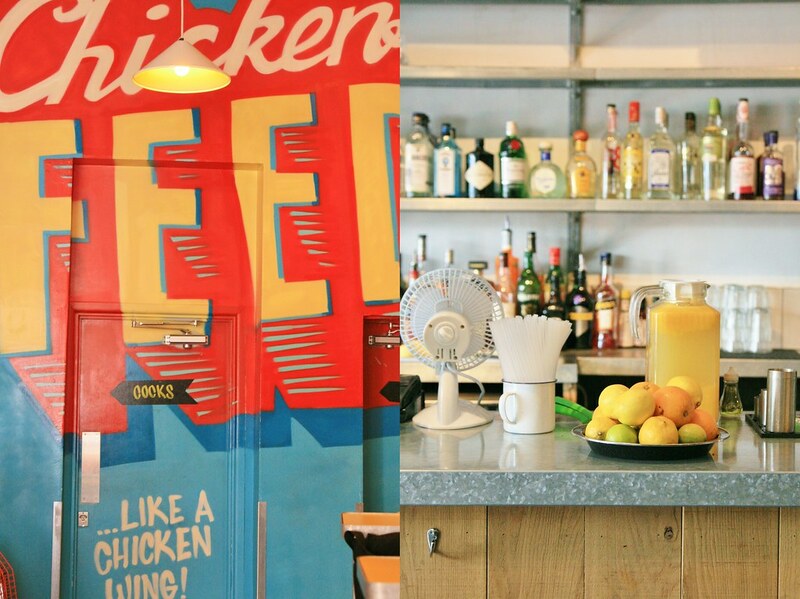 Having whiled away the morning blogging and editing photos in the Ritzy (free wifi), I decided to lunch at Chicken Liquor, a restaurant that serves, as you might imagine, chicken. And liquor. 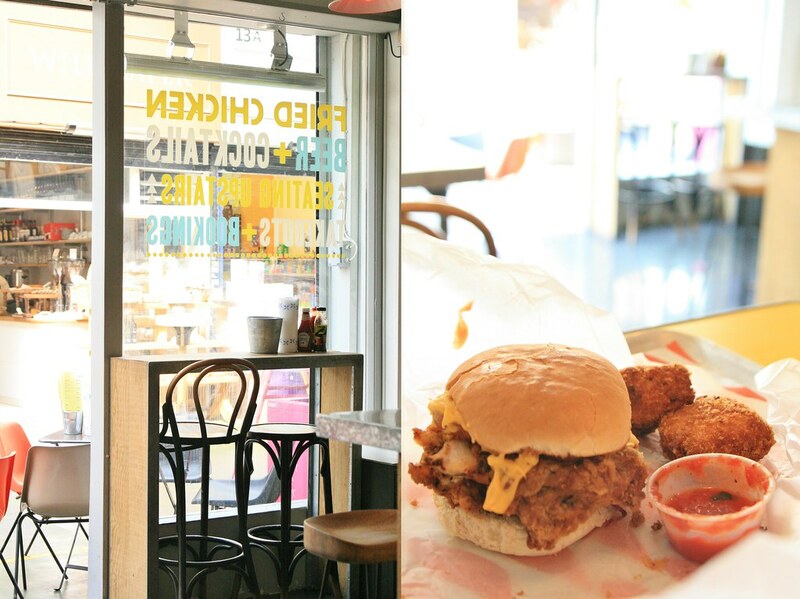 I can't speak for the latter as I only sampled a chicken burger. But I'd heard a lot about it, and knew they didn't take bookings. Its become trendy for London restaurants to do this as apparently forcing your customers to queue half way down the street is good free advertising. I'd rather book, but I suppose if you want to eat somewhere, you have to play by their rules. Given that I was pretty full of cake, I didn't go for lunch until three, and I found the place quiet. Good! I ordered a burger and a side and hopped onto a stool at a little table to await my feast. And a feast it was! I had ordered a tower burger which turned out to contain an ENORMOUS piece of fried chicken, jalapenos, slaw, dressing, cheese and a hash brown. And my goodness it was yummy, if challenging to eat. I should have known I wouldn't be able to eat it neatly as instead of providing serviettes, Chicken Liquor have equipped every table with a kitchen roll. I used it extensively. The side was deep fried mac and cheese. Seriously. Who knew such a thing existed? Macaroni cheese is probably my favourite food (I say again, nom nom) so I couldn't resist it. It was three balls of deep fried cheesy pasta and it was incredible. After the first 2 I had fallen in love. However, I feel duty-bound to inform you that it is after the third one that I felt a little bit...dirty. Like maybe I'd gone too far, and that perhaps some things shouldn't be deep fried. Or if they are then you shouldn't wolf down quite so much of said deep-fried substance in one go. Reflecting on the deep-fried mac and cheese, I don't know what to think. Maybe I should go back and have it again for research purposes? And maybe I should sign some sort of health form first to prove that I consumed it of my own free will. Who am I kidding. I loved it. I just think that maybe I should eat celery for a while and have some sort of industrial solvent squirted into my arteries. Feeling enormously full and hugely satisfied, I toddled back to the Ritzy for another cup of tea and a film They let you take your tea in with you. And the seats have little tables and tons of leg room. And they recline. Hands down my new favourite cinema, although I do have a few others to test out! I saw Begin Again which I absolutely loved. I have watched quite a few new films this week, but this has been my favourite. It's like a love letter to the city of New York, to music, to independence and following your heart. But I didn't find it as corny as that sounds. It's romantic but doesn't follow the usual rom-com themes and our heroine proves she can stand on her own two feet, which I like about her. I thought the performances were very good and I was completely swept up in the enthusiasm and the beautiful music. I will be buying the soundtrack as soon as possible. If you need a pick-me-up, I cannot recommend this film highly enough. Especially if you see it at the Ritzy! So all in all, a lovely day out which ended back at home, making dinner for me and the man and prattling incessantly about Begin Again, and whether it's a good idea to try deep fried mac and cheese again (he thinks not and that it's probably something that once you've tried it, you shouldn't repeat the experience. Pah, what does he know) Part of me hopes for a good, solid rainy day in the next few weeks as I would happily spend a day indoors at this beautiful cinema enjoying tea and cake, blogging and perhaps a bit of crafting, and catching a film. Nice to see the Ritzy getting some of your photo glory - my DD always enjoyed her visits here. It looks like a fun outing.